Patients with high blood pressure who have impaired cognitive function are at increased risk of developing dementia within five years. Despite this known link, cognitive function is not routinely measured in patients with high blood pressure. "The ability to draw the numbers of a clock and a particular time is an easy way to find out if a patient with high blood pressure has cognitive impairment," said study author Dr Augusto Vicario of the Heart and Brain Unit, Cardiovascular Institute of Buenos Aires, Argentina. "Identifying these patients provides the opportunity to intervene before dementia develops." 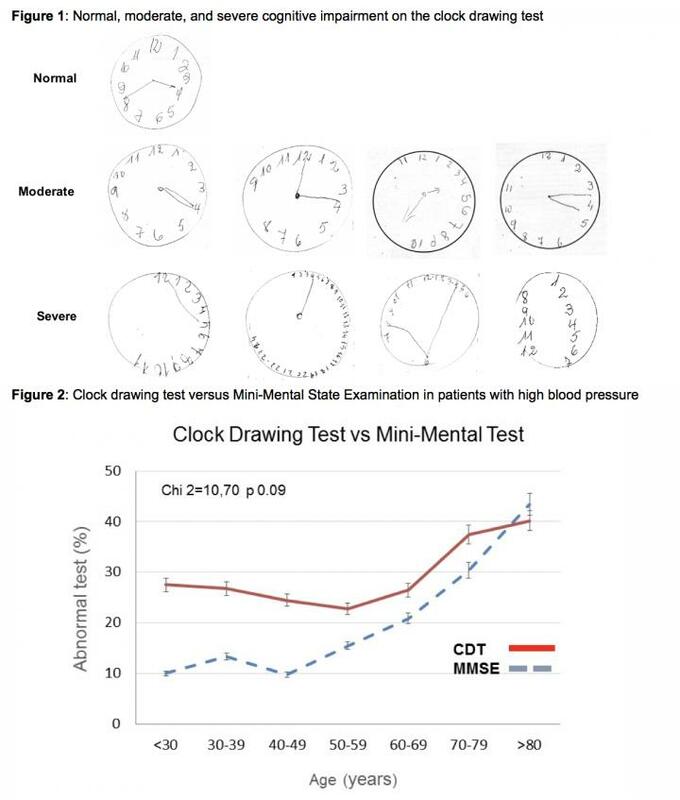 The Heart-Brain Study in Argentina evaluated the usefulness of the clock drawing test compared to the Mini-Mental State Examination (MMSE) to detect cognitive impairment in 1,414 adults with high blood pressure recruited from 18 cardiology centres in Argentina. The average blood pressure was 144/84 mmHg, average age was 60 years, and 62% were women. For the clock drawing test, patients were given a piece of paper with a 10 cm diameter circle on it. They were asked to write the numbers of the clock in the correct position inside the circle and then draw hands on the clock indicating the time "twenty to four". Patients were scored as having normal, moderate, or severe cognitive impairment (see figure 1). The MMSE has 11 questions and produces a score out of 30 indicating no (24-30), mild (18-23), or severe (0-17) cognitive impairment. The researchers found a higher prevalence of cognitive impairment with the clock drawing test (36%) compared to the MMSE (21%). Three out ten patients who had a normal MMSE score had an abnormal clock drawing result. The disparity in results between the two tests was greatest in middle aged patients (see figure 2). Dr Vicario said: "Untreated high blood pressure silently and progressively damages the arteries in the subcortex of the brain and stops communication between the subcortex and frontal lobe. This disconnect leads to impaired 'executive functions' such as planning, visuospatial abilities, remembering details, and decision-making. The clock drawing test is known to evaluate executive functions. The MMSE evaluates several other cognitive abilities but is weakly correlated with executive functions." He continued: "Our study suggests that the clock drawing test should be preferred over the MMSE for early detection of executive dysfunction in patients with high blood pressure, particularly in middle age. We think the score on the clock drawing test can be considered a surrogate measure of silent vascular damage in the brain and identifies patients at greater risk of developing dementia. In our study more than one-third of patients were at risk." Dr Vicario concluded: "The clock drawing test should be adopted as a routine screening tool for cognitive decline in patients with high blood pressure. Further studies are needed to determine whether lowering blood pressure can prevent progression to dementia."